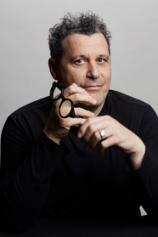 Isaac Mizrahi is sui generis: designer, cabaret performer, talk-show host, a TV celebrity. Yet ever since he shot to fame in the late 1980s, the private Isaac Mizrahi has remained under wraps. Until now. In I.M., Isaac Mizrahi offers a poignant, candid and touching look back on his life so far. Growing up gay in a sheltered Syrian Jewish Orthodox family, Isaac had unique talents that ultimately drew him into fashion and later into celebrity circles that read like a who’s who of the 20th and 21st centuries: Richard Avedon, Audrey Hepburn, Anna Wintour, Mikhail Baryshnikov, Meryl Streep and Oprah Winfrey, to name only a few. In his elegant memoir, Isaac delves into his lifelong battles with weight, insomnia and depression. He tells what it was like to be an out gay man in a homophobic age and to witness the ravaging effects of the AIDS epidemic. Brimming with intimate details and inimitable wit, Isaac's narrative reveals not just the glamour of his years, but the grit beneath the glitz. Rich with memorable stories from in and out of the spotlight, I.M. illuminates deep emotional truths.